The holiday home is located just outside the town of Telgruc-sur-Mer, a seaside resort in the far west of Finistère, at 44 km to the north-west of Quimper and at 54 km to the south-east of Brest. The holiday home is located just outside the town of Telgruc-sur-Mer, a seaside resort in the far west of Finistère, at 44 km to the north-west of Quimper and at 54 km to the south-east of Brest. You are staying in the heart of the Parc Régional de Crozon, where just a bit to the west from the town of Corzon you will find the Breizh Adventure Park offering paintball and an adventure trail through the trees, or you can ride in a buggy. 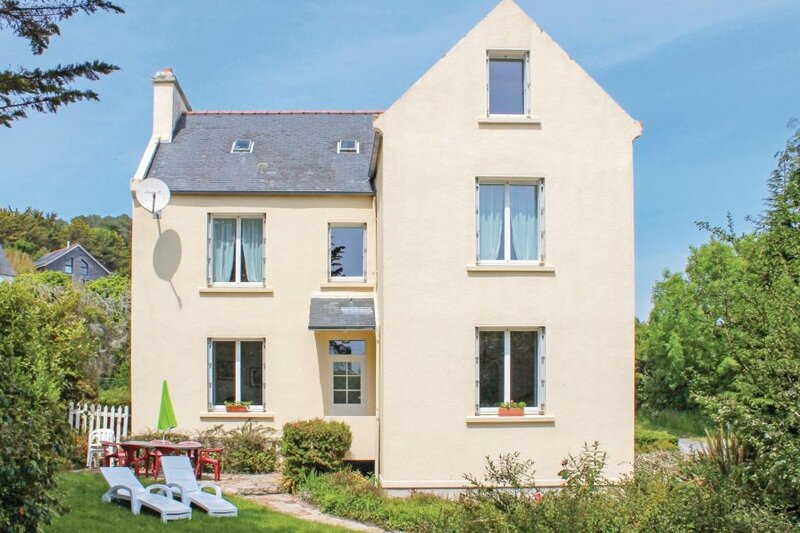 This large detached Breton house is located at about 700m from the sandy beach of Trez-Bellec-Plage on the bay of Douarnenez. In Douarnenez, located about 30 km to the south, you will find one of the most authentic fishing ports of Finistère. Right next to the cottage there is the heated swimming pool of the 4-star family campsite which is also run by the landlord of your holiday home. The pool with separate children's pool is open from the 1st June to mid-September. At the campsite you will enjoy volleyball, table tennis, table football, tennis court, tumble dryer and a snack bar in July and August. As a guest of this holiday house you may use the facilities of the campsite for free. The holiday house was renovated and refurbished in late 2014. The agent has rated it as a three star property so it is a well-kept villa, equipped with standard furniture. It is also good value for money. This villa has use of a shared pool and is located in Telgruc-sur-Mer. It is set in a very convenient location, just 700 metres away from a sandy beach. There's also a restaurant 1.5km away. You can also park in the garage on-site at no extra charge. The villa is adequately equipped: it has a dishwasher. It also has a garden and some garden furniture outside.